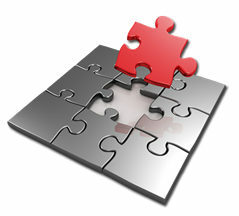 The path to IT credibility is by delivering projects successfully, , , and more. In Step-1 we discussed the most obvious – building an appropriate project schedule and managing your projects so you deliver them on time, within budget and meet your client’s expectations. In Step-2 we discussed the need to communicate the status and key issues of active projects, , , in other words, what’s going on in your IT organization. Effective communication is just as important, if not more so, than actually completing a project successfully. Step-3 is also about communicating effectively, , , and this one may be the most important of all. IT organizations need to make others aware of the value they contribute to a company. If you don’t, I can assure you people in your company won’t have a clue about what you are getting done for them and the contributions your team is making. It’s even worse than that. If you don’t continue to communicate your value and keep this in front of your client, , , they soon forget. You see, clients have very short memory when it comes to the IT organization, , , unless it’s something bad that has happened. Most do not remember what you did for them last week or last month, , , and if you haven’t been telling them they won’t even know how much you are doing to help your company succeed at all. Let me make something very clear, , , most of your clients aren’t paying attention to IT and how hard you work. They are focused on trying to meet their objectives and to take care of their own issues. Now, it’s not necessary that everyone in the company know what IT is doing and what you are accomplishing. The people who do need to know are senior managers and department managers, , , these people are your key client groups. Value, , , value, , , value. Most senior executives have a very difficult time determining what the IT value is for the company. They know we spend lots of money on IT support and technology but it’s difficult for them to quantify the value. In most cases, they simply do not know. If they can’t place a value on their IT investment, , , even if it’s as vague as Good, Average, or Poor, , , it puts you and your organization in a difficult position. Let’s get to the point. 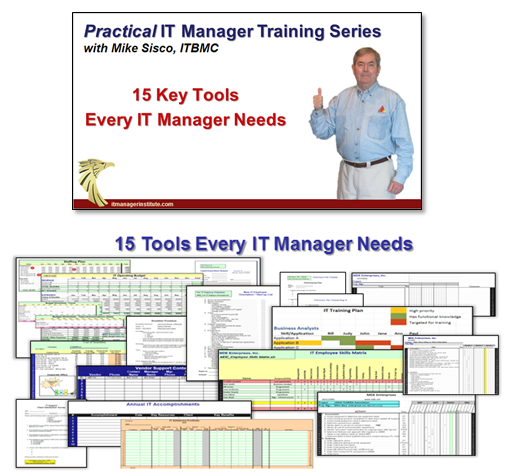 Your key clients, especially senior managers, need something that can help them place value in what your IT organization is accomplishing, , , and you certainly want them to view IT as a GOOD INVESTMENT . Are you aware that some studies suggest there is as much as a 70% failure rate in IT projects? That’s right, the studies point out that 70% or more of IT projects fail to be completed on time, are over budget, or do not meet the client’s needs. Well, let’s say that this is grossly over exaggerated. Even if it’s only half of that, say 35%, , , this is still a huge problem. Project failure costs companies billions of dollars in lost capital and productivity every year. It’s recognized worldwide as a big problem. What you want to be able to show is a positive track record of delivering projects successfully that contributes tangible value to your company. You want everyone to see that while the world experiences as little as a 30% success rate in IT projects, your team has an 85-90% success rate or higher. While other IT organizations struggle about how to show value, you want a report that shows the benefits and value derived from every project you do for the company. 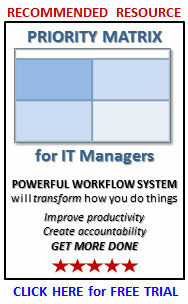 I like to use an IT Initiatives Portfolio to do this. I’ve written about this tool before. It is possibly the one tool that has helped me in my career the most. The reason – it shows in clear terms how good my IT organization performs in regards to delivering projects successfully and the value we are contributing in a very simple report. 3. Benefit results. In this report I have columns for expected results and achieved results for both 6-month and 12-month intervals. You won’t use these columns for every project but it is certainly helpful to list some type of business value benefit for every project you work on, , , this is the value contribution your team is making. 5. Overall success rate of each project – on time, within budget, achieving expected results, and meeting client needs. 6. Ongoing run rates of completing projects on time, within budget, and meeting client needs plus overall project success rate. This is your track record and you want people to know how good your team performs in completing projects successfully. In this example I’ve rolled it up so you can see the results of three projects. The nice thing about Excel is that you can summarize all the projects to calculate overall performance indicators at the bottom as I’ve done here. It helps to prepare an annual report that lists every project the IT team completed during the year and keep copies for every year to show progress and to analyze to determine how you get better. You will find this information becomes valuable to have handy at times. 1. Your IT team focuses harder to complete projects successfully. 2. Senior managers view you more as a business manager than a technical manager. Both of these are important for your credibility. Project success is the path to IT credibility, something you must establish if you are to attain any level of IT success. To get there you need to do more than just complete projects successfully, , , you must also communicate the status of active projects and make others aware of the track record and results your team achieves in delivering projects successfully. The tools and insight provided in this 4-part series will help you do all of this. 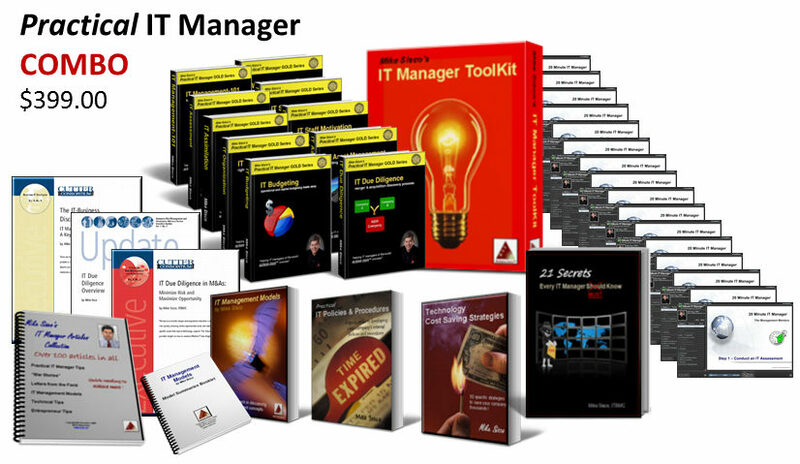 This entry was posted in IT Manager Tools and tagged it credibility, it success factors, project management, project management tips, project management tools, project manager. Bookmark the permalink.